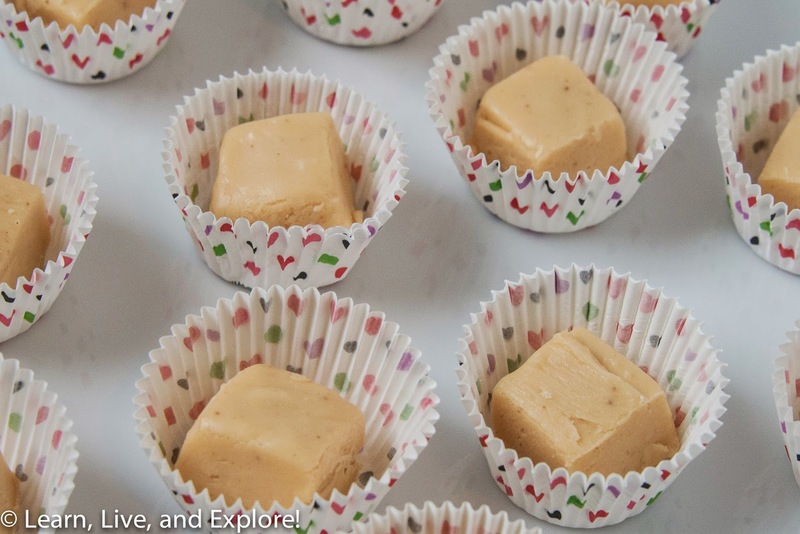 Brown Butter Fudge ~ Learn, Live, and Explore! Do you like the taste of caramel? Well, you are going to love these browned butter fudge pieces from IAmBaker! I wanted to try a couple of homemade fudge recipes this Valentine's week, but I didn't want to go with ordinary and predictable chocolate fudge. I was really happy with this sweet, yet nutty fudge morsel as an alternative way to make fudge. The recipe is very simple to make, even if you make a small mistake like I did and burn some of the fudge in the saucepan (which I fixed with a fine mesh sieve). Place the butter in a medium-large saucepan over medium-high heat. If possible, use a pan with a light bottom. Melt the butter and continue to cook it until it is a rich golden brown. Watch carefully because it will turn to golden brown really quick once it reaches a certain temperature. You want to avoid the butter scorching on the bottom. Once the butter is browned, add the sugar, evaporated milk, and corn syrup. Stir sugar until it is completely dissolved. Insert candy thermometer on the side of the saucepan. Cook slowly until the sugar mixture reaches 238 degrees F (or soft ball stage). Once the temperature reaches soft ball stage, remove the candy from the heat and let it cool to room temperature. If you find that some of the mixture burned on the bottom of the pan, like I did, get another bowl and strain the mixture through a sieve into the new bowl to remove the burnt bits and to return the fudge to a clean, smooth texture. Prepare an 8 x 8 inch pan by lining it with aluminum foil and spray the foil with nonstick cooking spray. Once the candy has cooled, pour into stand mixer. Start the mixer on low and slowly add in powdered sugar. Once the sugar is mostly incorporated, increase the mixer to high and beat the fudge until it loses its shine (approx. 5 minutes). Pour the fudge into the prepared pan, and smooth it into an even layer. Allow the fudge to set in the refrigerator at least 2 hours.